From the beginning of planning for our honeymoon travels, we knew we wanted to travel to Italy together. The thought had even crossed our minds to have a very small destination wedding in Italy with our families. Since we started dating, Matt and I had traveled to wine country regions all over the United States, and our most memorable wine country travels were in our home state of Arizona, and we ultimately decided to have our wedding in a beautiful vineyard property near the red rocks of Sedona. Amidst final wedding preparations in the two-week home stretch, my now husband Matt received an email with a travel flight deal alert. He had set up the alerts so that we could jump on any deal for our honeymoon. We were sitting on the couch one evening, I was trying to organize what felt like a billion different details, and Matt was on his laptop. We couldn't believe the alert -- $800 flights from Phoenix to Rome! The catch was that we had to travel in May, right after the wedding. We had originally thought we would wait until the Fall, but with the excitement and exhaustion of the wedding, we jumped on the chance. We often make spontaneous decisions to travel right for a weekend, but usually it is to nearby places we can drive to in under six hours like northern Arizona, California, or the nearby Mexico beach town, Puerto Peñasco. This felt fun, exciting, and the perfect chance to get away and enjoy ourselves post-wedding stress. Matt bought the tickets and decided to wait until after the wedding to plan everything else. Immediately when we told people we were going and how soon, everyone become a resident travel agent, giving us books and plenty of advice on where to stay, eat, and everything in between! When we created our Traveler's Joy website months before the wedding, we already had an idea of where in Italy we wanted to go. Our friends' and families' information helped add to our thoughts, and we even took some of their advice! By the time the wedding weekend was over, and we were tucked away in a cozy cabin in Flagstaff recovering for a few days, we had everything we needed to start to lay out and finalize our plans. 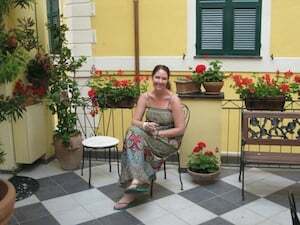 We arrived in Rome on May 16, 2011 and had chosen to stay at Hotel Memphis, in walking distance to many of Rome's most beautiful sights. Based on advice from our friends who live in Tuscany, we hired a driver – one of their friends – who picked us up within an hour of arriving in Rome and drove us all around the city and surrounding areas. We wanted to make the most of our trip, and knew that even after a long flight, that we shouldn't go to sleep right away, since we were landing in the morning, Rome time. Having a driver was amazing. He grew up in Rome, had the type of license which would allow him to drive anywhere and everywhere, including places where you can usually only get to if you are walking. We visited the Catacombs and took in two of the best views of Rome, which we would not have likely visited without our driver: Gianicolo which is the top of a hill overlooking the City, and "the hole of Rome" which is a tiny keyhole that reveals an incredible view of St. Peters. Matt also arranged for his phone to be loaded with minutes while we were in Rome - and it came in handy. Rome at night was fantastic! We found a great place for dinner and then walked to the Spanish steps, where we saw a wedding take place, and hundreds of people gathering. The piazzas in Italy are incredible places to people-watch and showcase the Italian life of eating, drinking, and chatting with friends and family. We were always amazed at how many families with very young children were out until midnight! After getting one night's rest in Rome, we immediately took the train the next morning to Cinque Terre, on both of our "must-do" lists for Italy. Our good friends had recently visited and recommended a beautiful place, La Poesia, owned and operated by the nicest woman who told us she was born in the room we were staying in, as was her mother! Cinque Terre is made up of five mountain villages, with Monterosso (where La Poesia is located) being the best location to stay overnight, as the other towns are primarily residential and do not have as many restaurants. We stayed two nights in Monterosso. Our favorite part was the hike through the five towns. I only wish that my pictures could have captured how beautiful the experience of the hike is, from the fellow hikers you meet along the way, to the views of the ocean, and the serenity of each of the towns. As we were coming down the turn into Corniglia, we came across three men singing and playing accordion. At night, we met other travelers, and spent time with the owner of La Poesia's daughter and her boyfriend, who own a small enoteca (wine bar) with free wi-fi! Another incredible part about Monterosso was the restaurant on the hill – La Tortuga – which looked almost exactly like the place we got engaged, El Farallon in Cabo San Lucas one year prior. 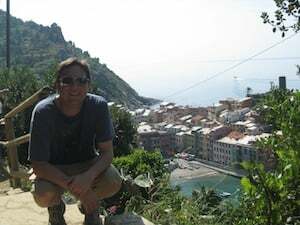 The sights, sounds, and smells of Cinque Terre will always be embedded in my memory. From Cinque Terre, we took the train to Santa Margherita and checked into the Lido Palace in a room right across from the water. Santa Margherita is a larger town than Portofino, and offers more reasonably priced accommodations and restaurant options. When we arrived, we hopped out the boat to Portofino, and enjoyed the ride. While our legs were still sore from the hike the day before, we strolled through Portofino, people watched, and visited Castello Brown, a castle that sits on a hill above the town and has a beautiful botanical garden. We rested our legs and had our first pizza of the trip at Pizzeria el Portico – it was so delicious I had to take a picture! After the boat ride back to Santa Margherita, we walked around the town, and found another spot to sit down, people watch, and enjoy some vino and our views of the water, sail boats and yachts. The next morning, we were both so excited to get on the train and head to Florence. 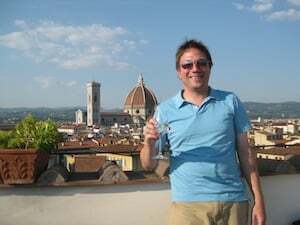 When I had traveled to Italy during college, Florence was my favorite place and I could not wait to go back, mostly because this time I would be with Matt, and we would be picking up a car to do what we do best, explore wine country and be spontaneous! Once we got in our cute little rental car, which Matt graciously had to drive because we chose a standard/stick-shift, we set off for Tuscany. We stopped first at Hotel Villa San Lucchese in Poggiobonse, another place recommended by a friend. We arrived during siesta, and the person who speaks English was resting. So I fumbled through my "Spanish-Italian" and settled into a beautiful room overlooking the gardens. We spent the next two nights at Villa San Lucchese, visiting wineries, driving all of the windy roads and some of the most incredible sights in Italy, including the walled cities of Tuscany. We went to San Gimignano, Siena, Monteriggioni, and Certaldo Alto, walking up, down, and on top of the walls, enjoying some of the best food and wine I will probably ever have in my life! From Poggiobonse we took our time winding our way towards the Chianti region where we would be staying with our friends Barbara and Giuseppe and Giuseppe's family for the next few nights. 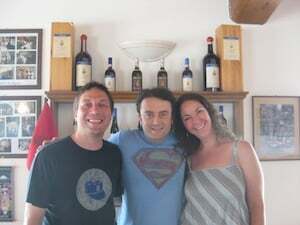 We first met Giuseppe and Barbara in 2007 when they visited the States during Italy's winter with a chef and held wine dinners throughout the country. Giuseppe and Matt hit it off right away. I call Giuseppe the Italian Matt (even though Matt is Italian too). They are both extremely gregarious, talkative, and engaging people. Every year they have come back to Arizona for their wine dinner, we get the chance to spend time with Giuseppe and Barbara, and always talked about when Matt & I would visit them in Italy. In 2011, we made it happen! Before getting to Montevarchi where Giuseppe lives with his parents and Barbara on their family estate, we stopped at Barone Ricasoli winery and Brolio Castle along the way, picking up some grappa for Giuseppe and his dad, and had one of the staff take us on an impromptu tour of the cellar and barrel rooms. When we arrived at Giuseppe's family home and vineyards called Selvatici, it was just as quaint and lovely as we had imagined. We had cheese and crackers, and all of my favorite I Selvatici wines in the front yard under his family's tree, walked through the vineyards and olive trees, and soaked it all in. When Giuseppe was done with work (the tasting room is right on his property), he took us to the villa we would be staying at during our time there. His uncle's summer home was located just down the road from his family home. It was a spectacular way to spend the middle of our honeymoon, just the two of us, alone in a small one-bedroom home in the middle of the Tuscan countryside. While this was something special for just the two of us, we also stopped by the newly-built Borgo di Fontebussi, just up the road from the winery. It was absolutely stunning. We loved our time in and around the Chianti region with Giuseppe and Barabara. We visited the town of Cortona, explored the village, and spent time with his family and friends. If I had to choose one highlight it would be the night Giueseppe's mom Carla made us homemade risotto, where she poured an entire bottle of one of my favorite I Selvatici wines (Malvasia) into the recipe! We were sad to leave our friends and our little villa but excited for our next adventure - Florence. Our hotel was a hidden gem, Torre Guelfa, right off the Ponte Vecchio, with incredible 360-degree views of all of Florence from the top of the hotel/tower, and a bar that opens for happy hour and is only for guests. We had initially planned to go up to Forte Belvedere, which has incredibly majestic views, but once we saw the view from the top of our hotel, we never wanted to leave! Florence was everything I had hoped for and more. Based on a recommendation from the bartender at the Torre Guelfa, we veered off course from a friend's restaurant recommendation and went on the other side of the Ponte Vecchio towards the university and area where more locals live. The meal was amazing, and the walk back at night was incredibly romantic. When we started heading back across, we walked right into the middle of an outdoor opera in the Uffizi piazza! Another favorite part of Florence was the Museo Galileo, a museum dedicated to the history of science, with one of the largest collections of historical scientific tools, preserved through history. I am no science geek, but it was incredible to see the origins of our modern day globes, telescopes, compasses, and other tools that were collected by the founding families of Florence. One final must-do in Florence was to visit the Officina Profumo Farmaceutica Santa Maria Novella. My mom had told me about this place and I knew I had to check it out. It is part apothecary shop and part perfumery. Even Matt loved this place! We suggest going right when it opens, and being one of the first customers, to avoid the crowds and be able to ask questions. Leaving Florence was hard, because we knew we would soon have to go back to reality and our honeymoon was over. We took the train back to Rome and checked into the Cancelli Rossi hotel near the airport. While it wasn't the nicest hotel, we figured that it would be best to be closer to the airport for an early flight the next morning. If we did it again, we both agreed, it would be better to spend our last night in Rome, IN ROME! But, we made the best of it. Our driver on our first day had told us about Trastevere, the only place in Rome where football (soccer) hooligans roam the streets and drink beer. We decided to check it out because it was the night of a big football match, the European Champions League between Barcelona and Manchester United. We walked around Trastevere for an hour before settling on a place with big TVs and two chairs to squeeze us in. We had the best time, met a couple from Portugal, American students who were studying in Florence for the year, and many Italians. It was a good way to end a wonderful two-week trip, which gave us just enough of a taste of Italy to want to go back as soon as possible! We would highly recommend Italy, and the towns and cities we visited to anyone. 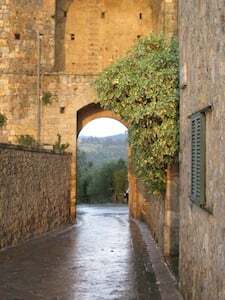 We tried not to cram too much in, knowing that we want to go back and explore other parts of Tuscany, Northern Italy, and the other coasts someday. The total cost of our honeymoon was around $4,800, and we were fortunate enough to have most of our trip paid for from our Traveler's Joy site and generous friends and family. We can't wait for our next adventure. Ciao!